We will again host two Graduate Cohort Workshops in 2019. The CRA URMD Grad Cohort Workshop is designed specifically for underrepresented minorities in computing and persons with disabilities in graduate school in computing fields. The CRA-W Grad Cohort Workshop is designed for women students in their first, second, or third year of graduate school in computing fields. The workshops will include a mix of formal presentations, informal discussions and social events. I am looking for a graduate research assistant who joined the USC at 2018 (not before) with minimum GPA 3.3 to work 10 hours/week for $15/hour (total ~$1200) from Oct 8 to Dec 3. Please send me an email, attach your unofficial transcript and your CV, answer the following questions. I am looking for two interns for my cloud practice with CS background, with strong penchant for programming. 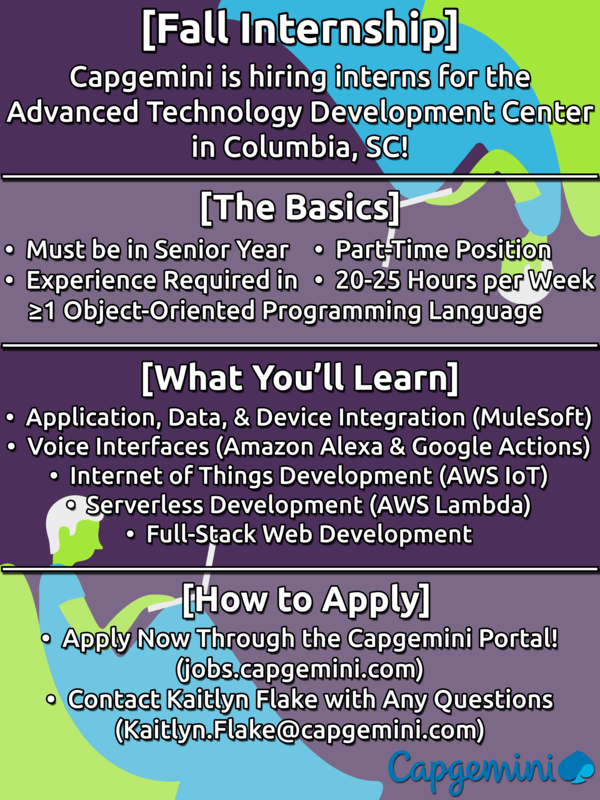 They will work on Alexa/Google Home Skills, JBOSS/JFUSE and MuleSoft type of programming opportunities at our Columbia ATDC. Will you please encourage your senior and junior students to apply? The University is having their STEM Career Fair on September 25th . SPAWAR will be participating and will be hiring. We have On-the-Spot Hiring Authority and will be making offers at the completion of the Career Fairs. This year our target is 150 New STEM Graduates and approx. 30 Interns. We are looking for Computer Science majors, Computer Engineers, Electrical Engineers, Mechanical Engineers, Math majors, Physics majors, Operations Analysts, etc.